We arrived home from Plymouth late last night along with the basket full of vegetables from my mother-in-law’s garden. So this morning before heading out for the day, I grilled some eggplant & zucchini, roasted portobellos, tofu & chickpeas, and made batch of quinoa. Took just over an hour and well worth it because all we had to do at dinnertime was grill some chicken for the boys. As you probably guessed, this bowl of veggie goodness served with a spicy balsamic vinaigrette was my plate. Click here for the Wasabi Roasted Tofu recipe from Vegetarian Times. No better way to enjoy the season's produce than with a big bowl of grilled and roasted vegetables. Can all be made ahead of time and served room temperature or heated up. 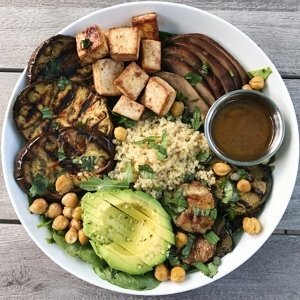 Can substitute grilled chicken or steak for the tofu. Wasabi Roasted Tofu recipe from Vegetarian times. Preheat oven to 400 degrees. One vegetable at a time, gently toss in olive oil, salt & pepper. Lay in a single layer on individual baking sheets or bake in batches.